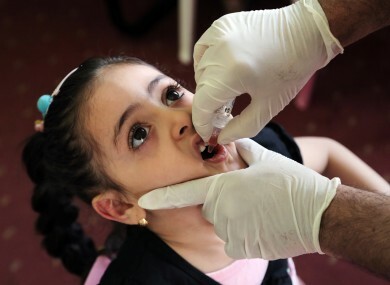 Dania Ahmed, 4, receives a polio vaccine at a health center in Baghdad, Iraq. THE WORLD HEALTH Organisation (WHO) has declared a Public Health Emergency of International Concern (PHEIC) over the spread of wild poliovirus. The decision was taken after a meeting of the Emergency Committee which discussed the recent outbreaks of the devastating disease in a number of countries. “The conditions for a public health emergency of international concern have been met,” WHO assistant director general Bruce Aylward told reporters in Geneva following crisis talks on the virus long thought to be on the road to extinction. The committee heard from nine countries - Afghanistan, Cameroon, Equatorial Guinea, Ethiopia, Israel, Nigeria, Pakistan, Somalia and the Syrian Arab Republic – about recent outbreaks. At end-2013, 60 per cent of polio cases were the result of international spread of wild poliovirus, and there was increasing evidence that adult travellers contributed to this spread. During the 2014 low transmission season there has already been international spread of wild poliovirus from three of the 10 States that are currently infected: in central Asia (from Pakistan to Afghanistan), in the Middle East (Syrian Arab Republic to Iraq) and in Central Africa (Cameroon to Equatorial Guinea). “A coordinated international response is deemed essential to stop this international spread of wild poliovirus and to prevent new spread with the onset of the high transmission season in May/June 2014,” said the WHO. The consequences of further international spread are particularly acute today given the large number of polio-free but conflict-torn and fragile States which have severely compromised routine immunisation services and are at high risk of re-infection. Polio, a crippling and potentially fatal viral disease that mainly affects children under the age of five, has come close to being beaten as the result of a 25-year effort. In 1988, the disease was endemic in 125 countries. The number of recorded cases worldwide has plunged from 350,000 in 1988 to 417 in 2013, according to WHO data. So far this year, 74 cases have been spotted worldwide – 59 of them in Pakistan, Aylward said. Email “Spread of polio is now an official international health emergency”. Feedback on “Spread of polio is now an official international health emergency”.